If you've been following BioWare for any length of time, then you know James Ohlen. When I interviewed him a couple of years back at PAX East and again last year at the Star Wars: The Old Republic guild summit, I could feel his sincere passion for the game. 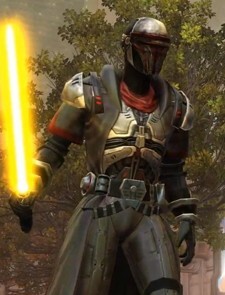 Ohlen joined the SWTOR project at its inception and held the creative director position for well over half a decade. SWTOR is as much his game as anyone's. As is common at the Game Developers Conference, developers speak candidly to other future game-creators about the inner workings of their studios' biggest projects. Sometimes those tales are cautionary; some are inspiring. This time, Ohlen's told the story of SWTOR, the game that currently holds the record as the second largest subscription MMO ever, and how free-to-play turned what could have been a tale of utter failure into a story of success. Ohlen began his presentation by dispelling some misconceptions about the creation of Star Wars: The Old Republic. Some journalists and fans attributed much of the upfront cost of TOR to its scripting and voice acting. Ohlen explained that this belief is erroneous: "[Voice acting] was a known entity, and cost was quite low in comparison to the cost of the rest of the project." In other words, BioWare had been there and done that with voice acting already in its other games and budgeted accordingly. However, BioWare did not have a tested platform to build an MMO. Much of the cost was funneled toward creating an engine that supported a team of over 300 people working on it at the same time and adding choice and consequence to the MMO story. "Don't be scared about adding voice over and cool cinematic content," he advised his audience, "but do be careful about adding lots of choice with consequence because that adds to QA cost and development cost and makes it hard to design everything." 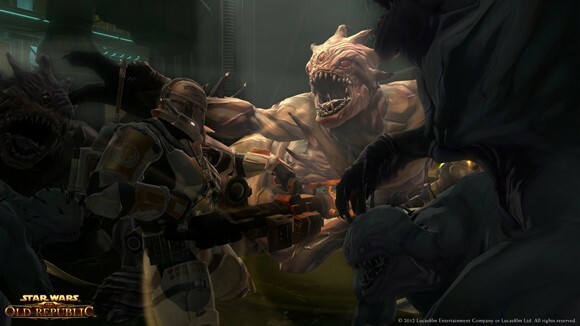 Ohlen also argued that the development time accorded The Old Republic was not overly long when compared to the average development time of triple-A MMOs. He explained that games like Guild Wars 2, TERA, and The Elder Scrolls Online bear a half-a-decade development cycle. SWTOR was no different. "Within four and five weeks, we suddenly had close to a half a million people at the endgame. It was something we didn't expect at all." As I listened to Ohlen's presentation, I was surprised to hear him admit to some of the mistakes the developers made when creating the game. But Ohlen explained that those mistakes were not completely unseen. "One of our concerns was about the elder game," he conceded. "It wasn't developed as much as we would have liked. It didn't have as many operations -- our versions of raids -- as we'd have liked. We didn't have some important social features such as a group finder to make finding groups at the elder game easier. We were also notably lacking on some guild features." He confided that the public testing was not as robust as the development team might have wanted. However, these challenges could have been dealt with had another misjudgment not been made. Based on BioWare's pre-launch metrics, the team expected players to get through the content in three or four months. This assessment might seem obviously wrong to an experienced MMO player, but we are talking about a game with extensive voiceover and literally thousands of cinematic cutscenes adding up to about 170 to 180 hours of content. So the devs anticipated that TOR would take more consecutive days to complete than the average MMO. But according to BioWare's metrics, players were tearing through the content an average of 40 hours a week; some players spent more than 120 hours a week in the game. "Within four and five weeks, we suddenly had close to a half a million people at the endgame," Ohlen said. "It was something we didn't expect at all." Players were unsatisfied and began to exit the game. Many of the positive changes were made while players were still leaving, but the impact would not be felt until much later. The group finder was introduced in the third update, and BioWare began the process of free character transfers and server merges. (Yes, he called them server merges.) Ohlen told the audience, "One of the major things you want in an MMORPG is the feeling that there are lots of players playing with you and an easy way of finding friends to adventure with." These two key additions helped make the next major change that much more successful. Ohlen called July and August a low point for the studio because many of his coworkers were laid off, subs were still going down, Ray Muzyka and Greg Zeschuk left BioWare, Guild Wars 2 was being "hailed as the be-all-end-all of MMOs," and he expected that Mists of Pandaria "was going to kick [BioWare] in the crotch." 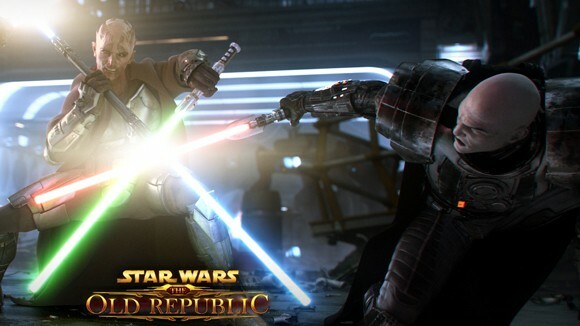 Everyone at the studio believed that free-to-play was really the best way to turn things around and get the fans back on SWTOR's side. How did BioWare tackle F2P development? "We had to come up with a system that made subscribers the core of the business," Ohlen explained. "But we also had to have an option that brought in new players." According to Ohlen, SWTOR was designed to be a subscription-based game, so any F2P option needed to still effectively support the service the way a sub game would. The most successful compensation came in the form of Cartel Packs. In the style of trading card games, these packs would give players random items that they could use in game. And just as in any good TCG, the items in the Cartel Packs could be traded with other players -- this time on in-game auction house, the galactic trade network. When free-to-play launched in November, it "blew all expectations out of the water," said Ohlen. Subscriptions started going up again. Concurrent players on the servers went way up. Both of those statistics continue to rise. As Ohlen put it, TOR is the second biggest subscription MMORPG in the western world, it has had two million new accounts since the F2P launch, thousands of new players try out the game everyday, and TOR is one of the largest microtransaction money-makers for publisher EA. SWTOR now has plans extending into the future including more expansion packs, like Rise of the Hutt Cartel and beyond. The plan is to introduce items into the game that do not exist in current MMOs. And thanks to the current success of TOR, BioWare is now the studio that will lead the charge for EA MMORPGs in the future, ones that aren't just Star Wars but other IPs as well. But most importantly, Ohlen told us, the morale of the BioWare community and studio has soared, and he hopes to tell us a different story for next year. Massively sent its ace reporters to San Francisco to bring you back the biggest MMO news from this year's GDC, the largest pro-only gaming industry con in the world! Whether it's EVE Online or Star Wars: The Old Republic or that shiny new toy you've got your eye on, we're on the case, so stay tuned for all the highlights from the show!